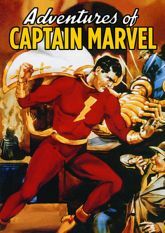 Considered by many to be the finest serial ever made, Adventures of Captain Marvel (1941) chronicles the exploits of Captain Marvel (Tom Tyler) as he combats the Scorpion (a hooded villain intent on obtaining six optical lenses that turn ordinary stones into gold)! These 12 chapters include fabulous flying sequences by Republic's ace special effects team, and co-star Frank Coghlan, Jr., William Benedict, Louise Currie, Robert Strange, and Harry Worth. This series, newly re-mastered from a 4K Scan by Paramount Pictures Archives, marks the very first time a comic book superhero's exploits were transferred to the silver screen.